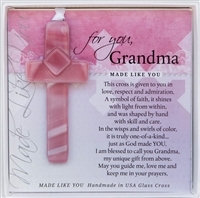 We personalize grandparent gifts for FREE! Tell us your grandparent name(s) and we will put them into one of our thoughtful gifts or inspirational poems, for a gift sure to tug at the heartstrings. If you see a poem on the site, that doesn't appear in the personalized area, feel free to contact us and ask if it can be done! Share your grandparent name story with us on Facebook, join the conversation!